“Wendy and Tat” from Christian Faith Publishing author Mark Mitchell is the story Wendy, her horse, and their unexpected journey. As they encounter interesting characters and a number of obstacles along the way, she will have to grow up fast. “Wendy and Tat”: a coming-of-age story about a girl named Wendy and her horse, Tattoo. “Wendy and Tat” is the creation of published author, Mark Mitchell, Christian, avid golfer and horse racing fan. 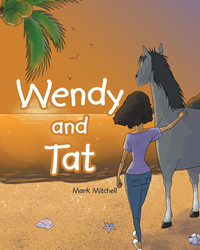 Published by Christian Faith Publishing, Mark Mitchell’s new book shares the adventures of Wendy and her horse Tattoo. “Wendy and Tat” is a coming-of-age story about a girl and her horse, Tattoo. Wendy is about to turn eighteen. In many ways, she is still a child, but circumstances beyond her control make her grow up fast. When she sets out on a journey, she will face a number of obstacles. Along the way, she will meet many different people who impact her life in many unexpected ways. She will have to use her skills as a horse rider to earn her living and make her way. View a synopsis of “Wendy and Tat” on YouTube. Consumers can purchase “Wendy and Tat” at traditional brick & mortar bookstores, or online at Amazon.com, Apple iTunes store, Kobo or Barnes and Noble. For additional information or inquiries about “Wendy and Tat”, contact the Christian Faith Publishing media department at 866-554-0919.